Geography/Culture: Chinese: Tantra Buddhist, adopted and modified by the Taoists. Originally from Hindustani. Description: Originally: Goddess of dawn; Personification of light; Protectress against war -- She became: Warrior Goddess of war; She Who is capable of innumerable marvellous feats; She Who excels in the magic arts; SheHe Who took the leading part in the Yin-chou wars; She Who uses dharanis (magic formulas). Iconography: As Goddess of light She has eight arms two of which hold hold aloft the sun and the moon. She is represented with sixteen or eighteen arms, bearing in Her various hands a sword, hatchet, bow, arrow and thunder-bolt. She also carries lotus, rosary, vase, etc. She is also represented with eigth arms and three heads one of which is that of a sow. Festival: Her birthday occurs of the 16th day of the third moon of the Chinese Calendar. Male Associate: She is sometimes considered male: Chun-T'i. Chinese Buddhist variant: Chun-T'i-P'u-Sa, ----. Chinese Taoist variant: Chun-T'i-Tao-Jen, ----. A form of Marici, Ray-of-Dawn, Who is linked with Vajravarahi, Strength-of-the-Sow. 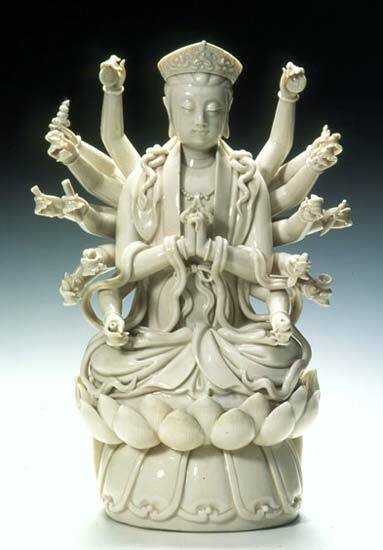 She is also called: T'ien-Hou, Heavenly-Mother, Who is linked with Tou-Mu, Mother-of-the-North-Star. worked on: October, June 1995; October 1994; August 1991; July 1990.